When I first visited Zimbabwe in 1996 it was the jewel in Southern Africa’s safari crown – business was booming and tourist dollars were flowing. Thanks to the malevolence of Robert Mugabe, more than a decade later not only was Zimbabwe’s economy destroyed but the tourists all but completely vanished. But the tide is slowly beginning to turn once again. Adventurous travellers who look beyond the headlines will find one of Africa’s most beautiful countries – a country which, in spite of years of political strife, remains rich in culture, heritage and pride. What’s more, the national parks here teem with wildlife. Elephants, buffaloes, hippos, lions, cheetahs, hyenas, monkeys, antelopes – you’ll find them all. For sheer numbers you can’t beat Hwange National Park, while Matusadona, Gonarezhou and Zambezi National Parks also offer rewarding wildlife viewing. My personal favourites are Mana Pools with its writhing pods of hippos (a canoeing safari is a must) and the wonderfully wild and remote Chizarira for its rugged beauty and pure African wilderness vibe (just don’t expect to see the Big Five). The best time I’ve found to plan your visit is in June/July during the dry season. It may be a little chilly at night, but it is easier to see wildlife with many of the larger mammals congregating around rivers and waterholes. Zimbabwe remains Africa’s great tragedy. Historically, it was an obvious choice as a safari destination and tourists flocked to this magnificent land. But no longer the breadbasket of Africa, it has regressed to become a poverty-stricken nation with decrepit infrastructure, under-resourced wildlife parks and few remaining quality safari operators. Robert Mugabe has systematically run his country into the ground and today only the most adventurous safari goers brave a safari to explore the neglected protected areas of Zimbabwe. Don’t get me wrong, Zim is an attractive country with friendly people and blessed with a rich natural heritage and prolific wildlife. From the huge elephant gatherings in Hwange to the big lion prides and buffalo herds of the Matusadona, Zimbabwe has it all. Unfortunately, Zim is also a country stuck in reverse. ‘Crazy Bob’ has done his utmost to destroy this beautiful land and, in the process, he has brought the local safari industry to its knees. With tourist numbers reduced to a trickle, many safari camps have fallen into disrepair or been forced to close. The parks themselves have also suffered from a lack of funding with a deterioration in the roads, many borehole pumps no longer functioning, and a general deterioration in quality of the safari experience. 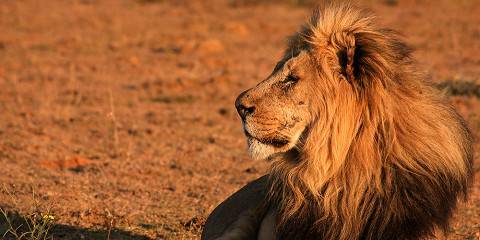 For those intrepid visitors who do brave the dilapidated infrastructure and challenges of travelling around a bankrupt, third-world African nation, there is the potential reward of rediscovering iconic wildlife areas with only highly knowledgeable safari guides and wild animals for company. I believe that the guides are one of the strongest reasons for safariing in Zim, as it is my experience that they are amongst the best on the continent and considerably enhance your interpretive nature experience. Yes, the country is still beset with political and economic difficulties but none of this affects visitors who book their stay with travel agencies and prepay most of the trip. Independent travellers will however find life rather more difficult given the chronic shortage of cash in the country. Elections in 2018 promise more uncertainty. Despite all this, it remains many people’s favourite country in the region with great wildlife viewing, wonderfully friendly and welcoming people, fascinating cultures and stunningly photogenic scenery and geological features. But the fact that Zimbabwe is still ‘out of bounds’ for many visitors means that today, with a couple of exceptions, you have the national parks almost to yourself. Zimbabwe has a number of national parks and each is excellent in its own way, although not all of them offer the ‘full-on’ game viewing opportunities that many people are looking for on their first safari. True, as with all its regional neighbours, poaching and illegal hunting has become a problem in some parks, but in others, the impact is hardly noticeable with rich and diverse concentrations of wildlife. The Big Five are still present in some of Zim’s parks although if you take the critically endangered rhino out of the equation, the remaining ‘four’ obligingly present themselves with a good deal of regularity. Other parks with fewer animals on show will blow your mind away in scenic terms. Two of them, Gonarezhou and Chizarira offer you an unparalleled wilderness experience such that you can spend a week in them and expect to see no other tourists, while some other national parks simply offer marvellous relaxation breaks. Humans, however, have had no noticeable impact on the magnificent birdlife in all the parks and this attracts serious birders to Zimbabwe in their droves. So my recommendations for the safari visitor are various. If this is your first trip and you want to ‘tick off’ all the major animals on your checklist, be sure to start with Hwange National Park which has huge concentrations of game in the dry season. If you’ve been on several previous safari trips and want something different, more than just the Big Five and you especially want to get away from the crowds, Zimbabwe’s parks are for you. Either way, I would definitely recommend booking with a small or specialist safari operator and making sure you are not ‘consolidated’ into a much larger group for your game drives. And if you don’t want to sit in a bumpy, dusty game drive vehicle for the whole of your two to three weeks but want to combine great game viewing with scenic and cultural pursuits – well you won’t find a better all-round destination than Zimbabwe. Finally of course, to optimise your game viewing opportunities, plan your visit for the dry season which is best throughout the country from June through October. When I first visited the country in 2000 I was coming to the end of a 5-country safari from Kenya, and Zimbabwe had struck me as the most beautiful African country I had ever seen. The people (most of them anyway) are remarkably friendly and wherever you are you meet with the Zimbabwean smile. I have travelled several times in Zimbabwe (sometimes on safari and sometimes on less relaxing assignments – as in 2002 when I was covering the farm occupations and was forced to leave the country in something of a hurry). The landscapes (with those postcard-perfect rock kopjes) is unforgettable and – back when I first travelled there – the wildlife was amazing. In 2008 I travelled through much of the country, seeing some areas that had suffered almost complete devastation since I first visited. The wildlife is still clinging on though in many places and a great many good people (of all races) are dedicating themselves to building towards a new future for Zimbabwe safaris. I believe that it is time for people with a genuine love for the African wilderness ought to support them by returning. One day, in the not too distant future, Zimbabwe will once again be well known as Africa’s most beautiful country. Until about 10 years ago, Zimbabwe was as close as you could get to safari paradise – the Victoria Falls, the Zambezi, the Matobo Hills, Hwange National Park, some of the world’s greatest elephant herds, magnificent scenery and even a superlative collection of lodges. Then politics got in the way. Since then, the parks and lodges have been struggling to survive against insuperable odds. But the basics are all still there and in spite of all the difficulties, there are still some world-class lodges. At present, tourism is heavily clustered into the northwest corner of the country around Victoria Falls, along the Zambezi and down to Hwange with the occasional foray by small plane over to Matusadona on the shores of Lake Kariba. It’s certainly quieter than in the tourism heyday, but if you didn’t know the background story, you’d never know there’d ever been a problem in this area. It all still works better than most of Africa. The quality of the wildlife is still superb and if ever I wish to think of my moment of perfect peace and tranquility, I summon up an image of sunset over the Zambezi – a bloodred sun behind the ilala palms mirrored in the indigo water while a family of elephants wades across to shore. Elsewhere in the country, visitors are few and far between. Some private game farms have been invaded, poaching has been on the increase and the drop-off in tourism has led to a desperate lack of conservation. But it’s worth exploring further afield. I’ve spent days exploring the extraordinary balancing rocks and cave paintings of the Matobo, while Gonarhezou is truly untouched wilderness. Now, things seem to have calmed down, although the underlying issues are by no means sorted. Tourism is definitely on the increase again. If you want to go to Zimbabwe, there is absolutely no question that you will be safe, you will be welcome and you will have a wonderful safari. In recent years Zimbabwe has made the headlines for all the wrong reasons, with its ongoing political difficulties having reduced a once thriving tourist trade to a mere trickle. This is a tragedy, as the country is a superb safari destination, with a huge variety of landscapes and wildlife. Its largest parks, such as Hwange and Mana Pools, offer a classic lowland safari experience, with large herds of game – especially elephant and buffalo – and abundant predators. A variety of smaller parks, meanwhile, are set in completely different landscapes, from the weird volcanic moonscape of the Matobo Hills to the lush montane forest of the eastern highlands, and here you will find many more unusual species – including a rich variety of birds. The Zambezi River forms the country’s northern border with Zambia, and flows through the popular tourist attractions of Victoria Falls and Lake Kariba, both excellent wildlife areas in their own right. I admit that I have a particular affection for Zimbabwe, as I lived in the country during the late 1980s and it provided my introduction to African wildlife. At that time it was an extremely easy and good-value safari destination, with an excellent national park infrastructure developed along similar lines to South Africa’s, and – even as a low-budget, independent traveler – there was little that I didn’t see. 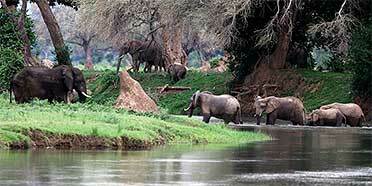 The wildlife and parks have since suffered from the inevitable poaching and neglect that comes with hard times. But the landscape is resilient, and the last few years have seen many safari operators increasing their activities. Reports are that game populations in key areas remains healthy – although conservation is in dire need of support. The more visitors that return, the more this situation will improve. Zimbabwe’s once-thriving safari industry crashed during the 2000s, and recovery remains painfully slow. For several years, safari companies, lodge owners and tourism officials have done their best to reassure would-be visitors that Zimbabwe’s parks are as safe and beautiful as ever, but many holidaymakers still avoid the country altogether in favour of Zambia, Botswana and Tanzania. On my recent visits, I was greeted extremely warmly, but was struck by the ghost-town atmosphere in some parks and lodges. Europeans and Australians were notably absent; almost all the tourists I encountered were from Zimbabwe, South Africa, the United States or Asia. Inevitably, the tourism downturn has affected levels of investment, with knock-on effects on facilities, environmental conservation and wildlife welfare, but the cost of safaris hasn’t really dropped to match. Nonetheless, some parts of Zimbabwe remain upbeat. The busy springboard town of Victoria Falls is a shadow of its former self, but it still offers some great places to stay and things to do, with pristine bush and riverscapes within easy reach. Here, the crowd-free conditions are a bonus, and I’ve never felt unsafe. Despite various setbacks, wildlife continues to thrive in Zimbabwe’s flagship parks, Mana Pools and Hwange, and the stunning scenery is, of course, as beguiling as ever. But to me Zimbabwe’s greatest strength is the quality of its guides and the authenticity of the safari experience at its small, independent camps and lodges. It remains an excellent place for traditional Big Five safaris of the type where your tent really is a tent, not a hotel room pretending to be a tent, bushwalks figure large on the agenda and you feel totally immersed in the bush. With lots of prime natural and historical attractions, Zimbabwe was once a big tourist hub in Southern Africa. Not anymore, unfortunately. Bad news has taken over and aside from Victoria Falls, which still gets a lot of fly-in visitors, the country’s parks are almost empty of tourists. Hwange National Park is Zimbabwe’s real gem. My biggest impression of the park is the big herds of elephants attracted by the artificial waterholes in the dry season. The Zambezi River, which forms the border between Zambia and Zimbabwe, is one of Africa’s main lifelines. There are plenty of crocodiles and hippos in the water, and there is lots of wildlife along the shore. A place to really appreciate the river is in Mana Pools National Park. Walking and canoeing safaris are conducted in the park, but strangely enough this is one of the very few Big Five Parks anywhere in Africa that allows unguided walking. Though unless you have a lot of bush experience, I certainly I wouldn’t recommend this. Matobo National Park is another place of great scenic beauty. Balancing rocks are the main feature of the park and some amazing bushman paintings can be seen on the rock faces. For many years I’ve been travelling around different parts of Africa experiencing safaris in many different parks and environments. Throughout all this time whenever talk has turned to safari guides, training or community conservation one word above others kept cropping up, ‘Zimbabwe’, but over the past ten to fifteen years that word has inevitably been followed by a sigh from the speaker. Zimbabwe, so everyone who knew the country said, was once in African safari royalty. It had some of the best parks, finest infrastructure and some incredible wildlife. But not just that the country had also earnt a solid reputation for its guides (particularly the walking guides) who were considered among the best trained and most professional in Africa. Zimbabwe could also be credited with giving birth to the original community conservation movement which is now making in-roads in conservation and tourism in many other parts of Africa. Sadly, though the country is today a shadow of its former self. More than a decade of misrule from Robert Mugabe has stripped the country of much of its safari credentials and left its once ground-breaking community conservation programme in tatters. Having listened to these kind of tales for what seems like years, in late 2015, I finally got my chance to go to Zimbabwe. I really had very little idea what to expect. What I found though truly left me impressed. My experiences were confined to the far southwest – the legendary Victoria Falls (infinitely more impressive from the Zimbabwean side than the Zambian side where, thanks to a major hydro-electric project, the falls are often just a trickle of bathwater) and huge Hwange National Park. Late November, when I visited, is not considered an ideal time of year to visit southwest Zimbabwe and, thanks to an extended drought in southern Africa, November 2015 was considered even worse than normal. But the truth is I was quickly hooked on the place. Yes, okay, so the famously large elephant herds of Hwangwe were nowhere to be seen but the sense of isolation was superb. Compared to South Africa, Kenya or Tanzania there was literally nobody else here and I frequently spent entire days without seeing a single other tourist vehicle. I also found the villages I visited fascinating. The houses here had a level of love plastered onto them that I don’t think I have ever seen anywhere in eastern Africa. Made of mud they might have been, but they were covered in bright, hand painted murals of animals and landscapes and as often as not had masses of flower pots filled with pink and orange blooms outside the doorways. And again and again, as I walked past these houses I would hear a call of invitation shouted out, “Please, you’re welcome. Come in” and one thing is for sure, despite the bad news that so often comes out of Zimbabwe I certainly would travel half-way across the world to be welcomed there again. For me this was one of the most refreshingly enjoyable places I have visited in many years. A good destination to combine game-viewing, fun activities, and natural attractions. Zimbabwe has a generous sample of the Africa many people hope to see – untamed savannah, mighty rivers, thundering waterfalls, and a good variety of African animals. The Victoria Falls are the principal attraction, where the Zambezi spills dramatically into the Bakota Gorge, and Hwange, Mana Pools and Gonarezhou are just some of the immensely rewarding parks to see big game. I particularly love the distinctively Zimbabwean landscapes; balancing boulders, giant baobab trees and ubiquitous beehive hut settlements scattered across the veld. Probably my favourite highlight of Zimbabwe is the wonderful people, and every time I visit I’m always struck by their warmth and friendliness. Service is impeccable with well-trained staff, and Zimbabwe is renowned for its professional safari guides who have gone a long way to lifting guiding standards across Africa. The diverse habitats are home to impressively large populations of elephant and buffalo and usually-rare species like roan antelope and wild dog. Safari options are not confined to the back of a vehicle, and there is also some excellent walking and canoeing too. The endless list of activities based around Victoria Falls includes bungee-jumping and white-water rafting, while excursions like scenic flights and river cruises offer the chance to see wildlife along the banks of the life-giving Zambezi. Despite its well-publicized political and economic problems, Zimbabwe’s tourist industry has rarely been affected and it’s always maintained its strong reputation as an attractive safari destination. It has a good choice of hotels, lodges and camps, Zimbabwe Parks & Wildlife Authority is pro-active at protecting the wild spaces, and added advantages for visitors include the new international airport opening at Victoria Falls and being able to use US$ (now the de facto currency). Strategically too, a big advantage is the proximity of Victoria Falls and Hwange National Park in the west to attractions in Botswana, Namibia and Zambia. Ignore all the negative connotations this country may have, Zimbabwe is one of the most beautiful African countries with some of the friendliest people. The previous political troubles have not impacted on the safari destinations – other than the staff are even more delighted to see you. And with the new political beginnings, now is the time to go. There are two key safari destinations – Hwange National Park and Mana Pools. Hwange is Zimbabwe’s largest national park and with a bit of luck you can see most big safari animals, including the rare sable antelope (though the few remining rhino are very difficult to find). There are a LOT of elephants and I’ve always been lucky with wild dogs. 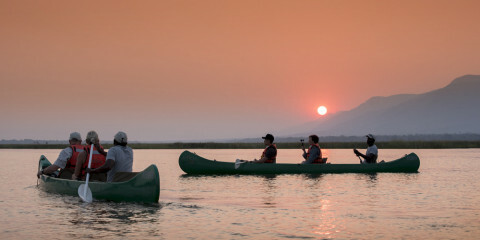 Mana Pools is one of Africa’s most beautiful parks, with its riverine glades of trees and the joy here is that you can walk or take a canoe trip on the Zambezi. Zimbabwe’s guides have the reputation for being among the best in Africa. Other travel highlights in Zimbabwe include the Matopos Hills, with its dramatic rocky landscapes, rock art and, thankfully, still good populations of rhino. And of course, no trip to Zimbabwe is complete without visiting the iconic Victoria Falls. Personally, I prefer visiting the Falls from the Zimbabwe side rather than the Zambian side, as the town is more attractive and there is more to see and do. Zimbabwe is a birder’s delight with more than 600 species, with many of the specials found in the Eastern Highlands. Wish List ticks include the African pitta, racket-tailed roller, Ayer’s hawk eagle and pennant winged nightjar. The best time for wildlife viewing is the dry winter months (May-October), when the game clusters around the water holes. However, the wet season can be great value and is the best time for migratory birds. The pivotal tourist attraction in Zimbabwe is the mile-wide Victoria Falls, an not-to-be-missed sight whose scenic magnificence has hit me afresh on each of half a dozen visits – and ensures that it regularly features alongside Kilimanjaro on those lists of the seven scenic wonders of the modern world. Vic Falls – as its known locally – is also a great centre for adrenaline junkies, with adventure activities ranging from the intimidating bungee jump from the bridge facing the mighty waterfall to white water rafting in the torrential Zambezi Gorge below the falls or canoeing on the more placid hippo-infested waters above it. As singularly impressive as Vic Falls in its own right is the ruined stone city of Great Zimbabwe, a medieval trade centre that qualifies as the most haunting African historical site south of Ethiopia. Zimbabwe is no slouch when it comes to game viewing, either. 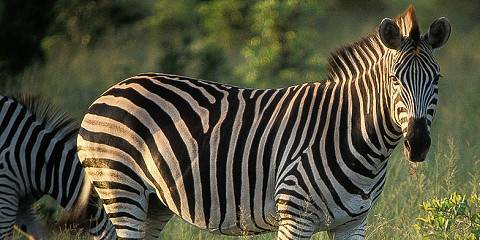 My favourite among its national parks, Hwange, a short drive south of Vic Falls, is justifiably renowned for its immense concentrations of elephants, but it is a also good for lion, giraffe, buffalo and other safari favourites, along with the rather localised sable antelope. Nearby Matobo National Park, the burial place of Cecil John Rhodes, is famed for its balancing rocks, and is one of many sites in Zimbabwe rich in prehistoric rock art. Another perennial favourite, set in the far northeast, is Mana Pools, which lies on the lower Zambezi, and allows unguided walking in an area famed for its Big Five sightings – another must for adrenaline junkies. The eastern highlands, meanwhile, offer some wonderfully scenic walking possibilities, ranging from serious hikes in the Chimanimani Range to some wonderful forest walks in Vumba and Chilinda. A feature of Zimbabwe at present is low tourist volumes associated with the negative international profile of the Mugabe regime, but the country’s beleaguered tourist industry deserves support, and the country offers a refreshingly untrammelled experience away from the few main tourist centres. ZIMBABWE really deserves top billing as a safari destination. In landscape terms it contains some of Africa’s greatest scenic splendours, from the awesome spectacle of the Victoria Falls to the bare granite domes of the Matobo Hills with their black eagles and prehistoric rock art caves; and its wildlife parks are second to none. I’m thinking of Mana Pools on the mighty Zambezi, and the classic elephant country of Hwange, whose camps and lodges are as good as you’ll find anywhere. And Zim’s professional safari guides are still the best. But sadly, these are not normal times. The unrest caused by President Mugabe’s years of misrule has caused untold damage to the country’s tourist image and infrastructure, and as a result Zimbabwe has simply fallen off the tourist map so far as many tour operators are concerned. Yet most of the few visitors who have been recently all seem to have had a good time, encountered no problems and been warmly welcomed. In the end, the decision to go or not to go is a personal choice guided perhaps by the latest Foreign Office travel advice.